Preheat oven to 190°C/375°F. Hull and slice strawberries into rounds. Chiffonade basil into long ribbons. Roll pizza dough out onto a parchment-lined baking sheet. Top with shredded mozzarella, large crumbles of goat cheese, and strawberry rounds. Bake at 190°C/375°F for approx. 20 – 30 min., or until the cheese is bubbling and the crust is golden-brown. Meanwhile, make the balsamic reduction by combining balsamic vinegar and honey in a small saucepan. Simmer over medium-low heat until reduced by half, approx. 10 min. 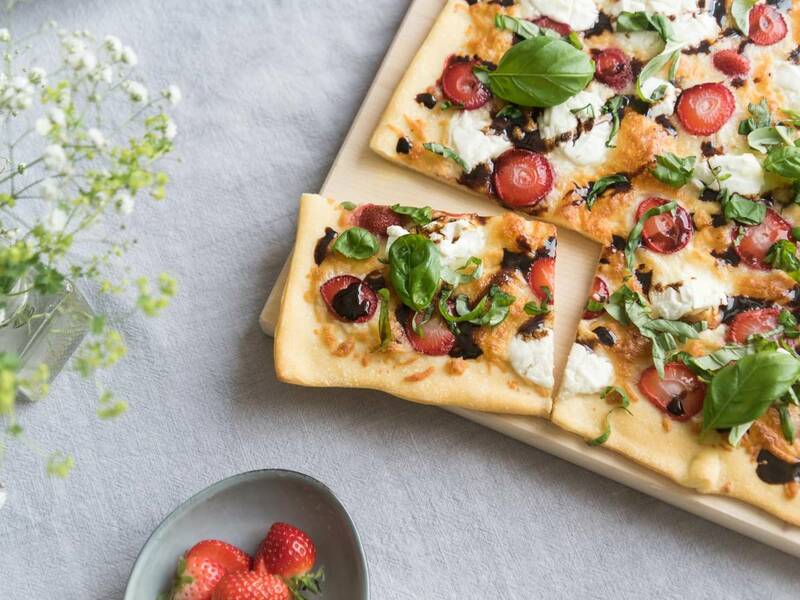 Sprinkle pizza with basil, season with salt and pepper to taste, and drizzle with balsamic reduction. Enjoy!